Felix Mendelssohn wrote his Piano Concerto no. 1 in G minor Op. 25, in 1830, at the same time he worked on his Italian symphony. It was premiered the following year in Munich. Though it is referred to as Mendelssohn's first piano concerto, this isn't quite correct. 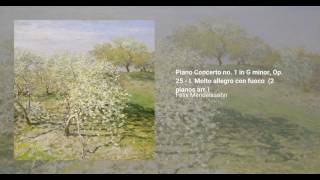 It is the first concerto for orchestra and piano, but Mendelssohn had at that point already written a concerto in A minor with string accompaniment, and two concerti for two pianos. The Piano Concerto no. 1 in G minor calls for a standard orchestra, and takes around 19 minutes to be performed in its entirety.